UNITED STATES of AMERICA. 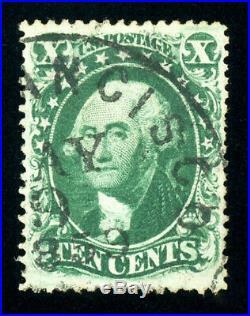 10c George Washington – Green, Type III. With a black “San Francisco / May 9, 1859″ cds cancellation. 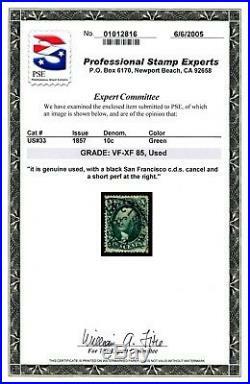 2005 Professional Stamp Expert certificate #1012816 graded 85. Stating – it is genuine, used, with a black San Francisco c. Cancel and a short perf at the right. 1984 Philatelic Foundation certificate #129705. New York State residents. If you have questions regarding this 10c 1857 Type III, please contact Christopher Rupp. Every inquiry will receive a prompt and candid reply. The interest is appreciated. Rupp Brothers was established in 1975 – this is our 44th year in business as professional philatelists. Rupp Brothers is actively acquiring stamp collections and better-quality individual stamps. Most certificates issued by these expertizing organizations are viewable on their websites. 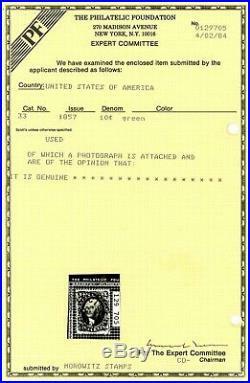 Rupp Brothers can review online images of your certified stamps and quickly determine their market value. We are particularly interested in the 1847/1856 Issue (Scott #1-17), 1869/1875 Pictorials (Scott #112-133), dollar-value Columbians (Scott #241-245), First Bureau Issues (Scott #246-284), Trans-Mississippis (Scott #285-293), the 1903 Second Bureau Issue (Scott #300-322), the Graf Zeppelin Issue (Scott #C13-C15) and the Shanghai/China overprints (Scott #K1-K18). The item “Scott #33, USED, VF/XF, May 9 1859 SF cds, 2005 PSE (graded 85), 2019 SMQ $450″ is in sale since Sunday, August 19, 2018. This item is in the category “Stamps\United States\19th Century\ Used”. The seller is “ruppbrothers” and is located in Locust Valley, New York. This item can be shipped to United States, Canada, United Kingdom, Denmark, Romania, Slovakia, Bulgaria, Czech republic, Finland, Hungary, Latvia, Lithuania, Malta, Estonia, Australia, Greece, Portugal, Cyprus, Slovenia, Sweden, Indonesia, Thailand, Belgium, France, Hong Kong, Ireland, Netherlands, Poland, Spain, Italy, Germany, Austria, Bahamas, Israel, New Zealand, Philippines, Singapore, Switzerland, Norway, Saudi arabia, Ukraine, United arab emirates, Qatar, Bahrain, Croatia, Malaysia, Colombia, Costa rica, Dominican republic, Panama, Trinidad and tobago, Guatemala, Honduras, Viet nam, Uruguay.